I was soooo looking forward to reading this, after having thoroughly enjoyed Miranda’s debut novel, Fairytale of New York and then having been invited to the launch of Welcome to my World in November 2010. This is an even better read than Fairytale and I pretty much gobbled it up in one sitting. 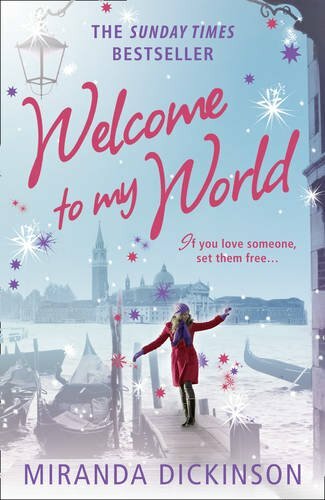 Welcome to my World tells the story of Harri, a travel agent who hasn’t actually been on holiday anywhere outside the UK yet, which is in stark contrast to her best mate, Alex, who has recently returned home to the Black Country village of Stone Yardley, after extensive travelling. I loved the structure of this book. When the book opens, something has happened to make Harri take refuge in a cubicle of the ladies’ toilets at Stone Yardley Village Hall. Each chapter returns to Harri in her cubicle and then goes onto reveal more backstory until it leads up to the present and takes you from there on to the conclusion. It’s an unusual device but one that really works well and each time it lets you digest what’s happened to date before the story moves on. Miranda excels at writing characters, and not just when it comes to the main ones. You get a whole village of them here. She is also very clever at bringing a place to life within her books and making it a character in its own right, something she did exceptionally well with New York in Fairytale of New York. While reading the book, the villagers and vilage of Stone Yardley felt so real that it was almost as if I knew them and was living among them. As with Fairytale, I felt that the ending was a little rushed, although that could have been partly due to me frantically turning the pages to find out how it was all going to end for Harri! I cried, laughed, shouted and giggled my way through this and now can’t wait to read It Started with a Kiss, which is out in November 2011.
you are only making me drool some more. Postmaster where are you?!?! Oh good, I’m glad you enjoyed it so much. I loved Fairytale of New York and look forward to reading this book too. If you loved Fairytale, you’ll definitely enjoy Welcome to my World every bit as much, if not more so. Look forward to hearing what you think of it, Debs. I haven’t had the joy of reading any of Miranda’s work – but I’ll be looking out for it after this review! Great stuff! I’m sure you’ll enjoy her books – I love the worlds she creates in them. Be sure to let me know what you think. Yay! You’ll love it, I’m sure.